The “Uptown & The Bronx” bar is the new trendy place in Buenos Aires! Located in the residential district of “Parlermo”, you will discover in this Argentinean bar-restaurant a real New York subway station. All the decoration transports you into an “underground” universe: you access the bar through a real subway mouth, and the decoration is an exact reproduction of the inside of a subway train. A vast glass counter dominates the room, composed of several dining rooms that copy the atmosphere of American dinners: car plates on the walls, neon lamps…. On the bar side, we offer you signature cocktails: the “Niuhi”, or the “AfterDark” to name but a few. To have a drink, you will have to pay between 5 and 7 euros. And in terms of cuisine, we always stay within the theme thanks to the menu of chef Dante Liporace, who offers a revisit of New York cuisine in “street food” mode. You can enjoy, for example, a nice cheeseburger bacon or let yourself be tempted by a blue cheese ice cream on a small apple pie. All this in a lively atmosphere and American music. The “Uptown & The Bronx” is not a common bar: it is inspired by the tradition of speakeasies. Invented during Prohibition, clandestine bars are now popular with the general public. Who has never been attracted by the taste of transgression and the forbidden? In general, one enters through a back door and the entrance is often hidden. In the case of the “Uptown” bar, you will have to walk through a maze of corridors before you come across the huge counter. 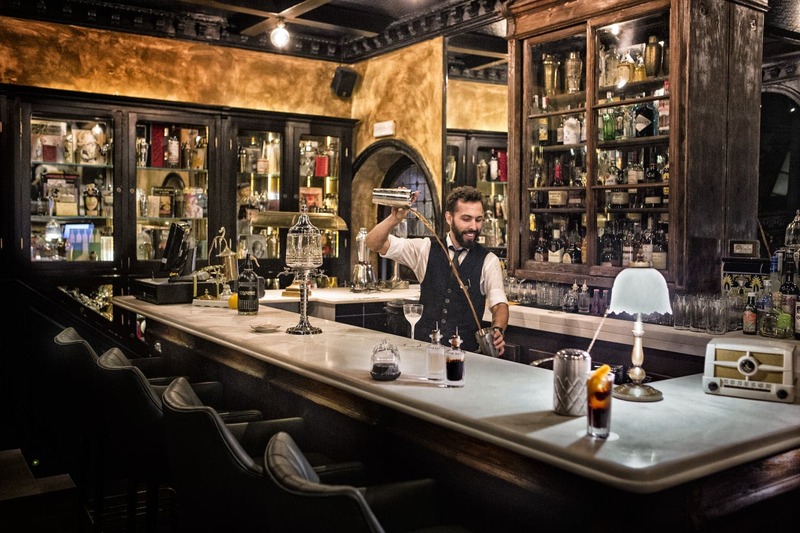 Etymologically, the term “speakeasies” comes from the fact of “speaking softly”, “whispering”. At the time of Prohibition, in the United States, the manager of a speakeasy bar asked his customers to remain discreet so as not to arouse the suspicions of the police. And take the risk of finishing the night at the station….